Rent Centric is is built to help vehicle rental companies manage their business, customers, employees, customers as well as revenues. The online and mobile platform include features such as fleet reporting, financial management, record of maintenance, and vehicle tracking. The company offers an internet reservation system that customers can use to make vehicle reservations online. The system stores client profiles and their rental service preferences for future visits. These rental service options can be added to the operator’s website. Rent Centric works with Apple Watch so users know their vehicle location, lock and unlock it, report damage to vehicle, and monitor fuel levels. The system has automated split-billing function that enable multiple or single parties to split bills easily and accurately. Rental managers can use auto reporting to get summary breakdowns of rental contracts and operations. Rent Centric’s on-demand self-serve rental management software and technology is an always-accessible vehicle reservation system. With this app, taking rental reservations is no longer limited to telephone and walk-in traffic – it’s live in the cloud and gives your rental business greater flexibility and scalability. With Rent Centric, you can easily increase your car rental revenue, expand your regional market share, and grow wherever your target market is. The product can help you broaden your customer base, while making your rental experience easy and smooth. Rent Centric has widened the management system by expanding beyond the traditional areas of car rental software and offers channel distribution management and cost-reducing operations management features as well as online sale of additional rental products and services. In addition to its wide scope, Rent Centric can be extended further for lead generation and online marketing through integration with distributor and partner platforms. Rent Centric’s cloud-based service gives your business the ability to multiply the number of service locations offered to customers without the increased costs associated with large traditional retail outlets. Rent Centric offers comprehensive online reservation capabilities, sales tracking, targeted digital marketing, high-traffic portal reservation and more. You get a complete back office management system that is accessible from anywhere. Rent Centric offers advanced management automation at an affordable cost. You can use the pricing calculator on the website to get an exact quote for your business. Rent Centric also offers custom development services to enable its clients to incorporate additional features. They can submit ticket requests at the customer support zone and track their progress. Rent Centric offers secure credit card processing without the need for a POS terminal. All transactions and customer info are stored securely in the vendor’s management portal, making tracking easy and safe. Every year, the use of suspended and fraudulent driver’s licenses costs the auto rental industry millions of dollars. Rent Centric offers real-time driver’s license verification to protect you. Corporations, academic institutions, and governments face a host of challenges in managing their own vehicle fleets. Rent Centric offers added functionality for these clients including: managing vehicle inventory needs, handling reservation complexities, keeping track of internal billing details, and managing members. Rent Centric allows your business partners and affiliates such as hotel concierge or local body shop owners to login to a separate portal to manage their rates and create real-time reservations. The affiliate can also track the customers serviced through them and the calculations of their up-sell margins and commissions. The system allows to you to effectively track your sources and manage targeted incentives such as commissions pay-back. The Rent Centric mobile app is available for Android, Apple as well as Apple Watch and is designed for a full-featured self-service on-demand car rental and car-sharing experience by the end-user. 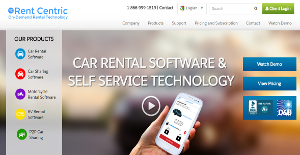 If you are considering Rent Centric it might also be sensible to analyze other subcategories of Best Car Rental Software collected in our base of B2B software reviews. Organizations have unique needs and requirements and no software application can be ideal in such a situation. It is futile to try to find a perfect out-of-the-box software app that meets all your business requirements. The smart thing to do would be to customize the solution for your unique requirements, employee skill levels, finances, and other aspects. For these reasons, do not hasten and invest in well-publicized trendy systems. Though these may be widely used, they may not be the best fit for your unique requirements. Do your research, check out each short-listed system in detail, read a few Rent Centric reviews, call the maker for explanations, and finally select the app that offers what you need. How Much Does Rent Centric Cost? We realize that when you make a decision to buy Car Rental Software it’s important not only to see how experts evaluate it in their reviews, but also to find out if the real people and companies that buy it are actually satisfied with the product. That’s why we’ve created our behavior-based Customer Satisfaction Algorithm™ that gathers customer reviews, comments and Rent Centric reviews across a wide range of social media sites. The data is then presented in an easy to digest form showing how many people had positive and negative experience with Rent Centric. With that information at hand you should be equipped to make an informed buying decision that you won’t regret. What are Rent Centric pricing details? What integrations are available for Rent Centric?